We had a busy busy weekend of not leaving the house. 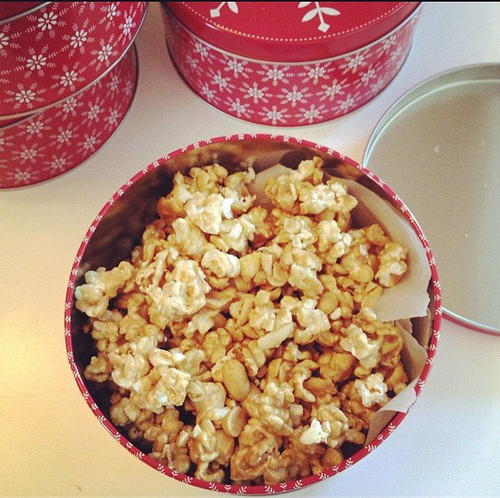 We made Orangette’s caramel corn for passing out as we do every year. So yummy! 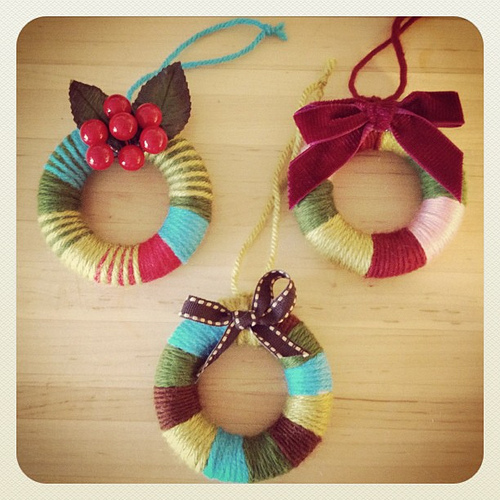 We tried our hand at yarn wreaths (from Christopher and Tia). Oscar gave up because he couldn’t make it neat enough so I just made them myself. 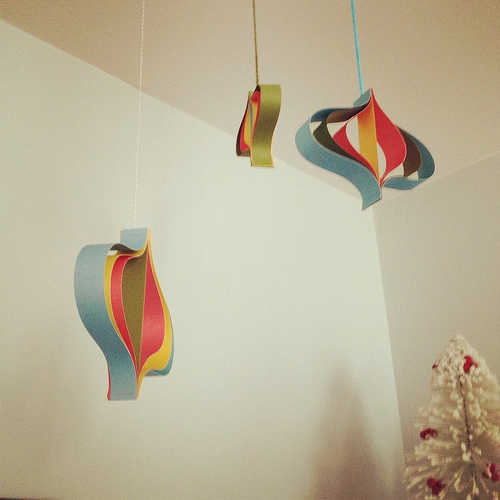 Both kids loved these modern paper ornaments over at Design Sponge. They’re like magic! I want to do lots of paper things this year but here’s what I don’t get… you need paper printed on both sides for all these cool things (like these). Where do you get that? Scrapbook paper is one sided, my cute wrapping paper is one sided. Gluing cute paper back to back is too bulky. Is there something I’m missing? 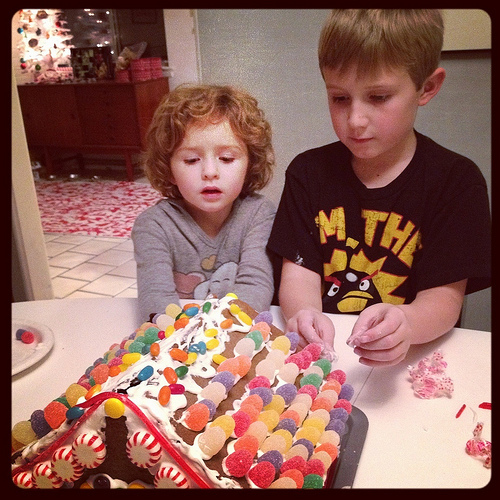 We also tackled the make it yourself from scratch gingerbread house. I don’t want to say never again but, how about not again for a reeeeally long time. What the crap? That’s impossible! Getting those edges to match up. Baking all those sides to be flat and sturdy and straight. Ours is seriously leaning and gapped. Oh well, the kids just like to shovel candy in their mouths like they’re getting away with something. Maybe next year I’ll just go straight to the bowls of candy. You can find double-sided scrapbook paper, I have some in my stash. All we have is a Michael’s here in town, so I must have gotten it there. We used to use solid colors, so it wasn’t an issue, but the patterns are pretty. Good luck looking. Here is how I get around the problem of wavy edges and corners not matching up: I use hot glue to connect all of the joints. Then I hide the gobs of glue with the icing. This means that we get o the fin candy part before we have all lost interest. My suggestion for double-sided paper: print your own. I use Epson’s double-sided matte photo paper. The reprodepot pattern books are great sources. I love your post, the wreaths are cute, I think I’ll try them, and I love the gingerbread house, looks yummy! They really do take a lot of practice to perfect but the kids love them. my mom always used cans of veggies to hold the structure upright while the icing dried – one on each side of the walls. does that make sense? anyhow, it looks like a good and festive season at the wee wonderfuls house! merry, merry! Most origami paper is double sided. trader joe’s a-frame gingerbread houses is where it’s at. and they are cheap. Oh, those paper ornaments! My children and I made oodles of those years ago (after mid-century, before mid-century modern – always hopelessly out of step, am I). We used neon coloured computer paper. I bet they have better colours nowadays! Those wreaths and ornaments are adorable! I got a gingerbread house kit from Ikea for about $3-4, it worked pretty well, but I still say never again. What a pain that icing is and the mess! http://www.candycottage.us/ It pretty much rocks! Who really cares about the gingerbread part?? There is some paper for ya, Hillary! Your little wreathes are just darling! I just received a pad of double-sided scrapbook paper as a Christmas gift and your question here was my first thought. I think my “giver” found the pad at TJ Maxx or Homegoods, although the brand is one I recognize from Michael’s/AC Moore. The problem with origami paper is that it’s too small to make the stars. You need paper that’s at least 12 inches long so that you can cut strips a little less than 1 inch wide. They recommend 20inch long paper for inch-inch 1/2 wide for bigger stars. That double sided wrapping paper would be great for that! I use 12 inch scrapbooking paper bought from a scrapbooking store, but I’ve also seen the same stuff at Michael’s. They truly are addicting once you get the hang of it…I hope you make some!